Caricatures are sketches of a person or behaviour depicted in a simplified, exaggerated or distorted manner. However caricatures appear only at a superficial glance simple drawings, in fact they contain deep and complex insight in our culture and society. This consideration is also true for scientific caricatures, dealing with subjects or persons involved in science and research. Such caricatures can be used as a source of information to explore and teach earth-sciences. Scientific caricatures can carry a lot of information, not only about the depicted person or the geological model, but also how new theories are accepted by society. In the Victorian England there was a vivid interest in natural sciences, especially geology, and it was also a time of radical ideas and controversial new hypothesis - like uniformitarianism, glacial theory and evolution. There was a large audience for caricatures. When direct criticism wasn't possible due gentleman's agreement, cartoons provided anyway an indirect way in which the artist or commissioning geologist could criticize a hypothesis or theoretical position. 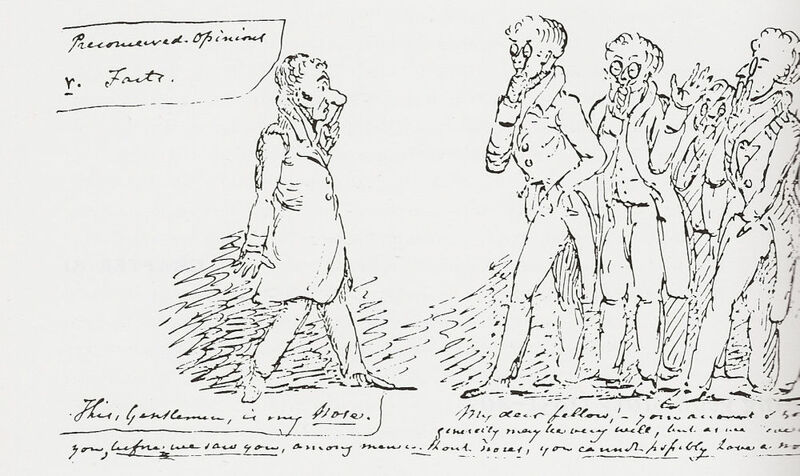 The most famous caricatures, depicted many times in books dealing with geology and palaeontology, were produced by the English geologist Henry De la Beche (1796-1855) to lampoon the theories of Charles Lyell and other contemporaries. 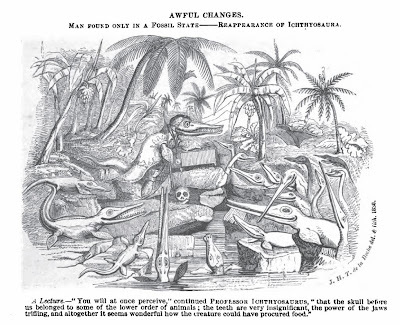 The prominent "Professor Ichthyosaurus", depicted in the cartoon entitled "Awful Changes" (drawn in 1830), was considered for a long time to be inspired by William Buckland (1784-1856) and his teaching methods. The caricature was widely publicized in Francis Buckland's (1826 - 1880, son of William) book-series "Curiosities of Natural History" (1857-72), in part a biography of his father, and the idea of Buckland caricatured by De La Beche seemed reasonable. Fig.1. "Awful Changes. Man Found only in a Fossil State - Reappearance of Ichthyosauri." - "A lecture, - 'You will at once perceive,' continued Professor Ichthyosaurus, 'that the skull before us belonged to some of the lower order of animals; the teeth are very insignificant, the power of the jaws trifling, and altogether it seems wonderful how the creature could have procured food." However the geologist and dedicated earth-science historian Martin J.S. 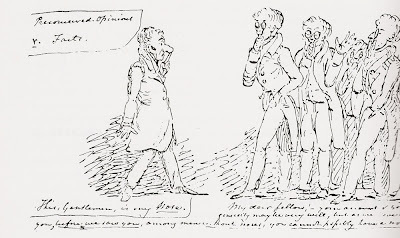 Rudwick realized the connection of this scene with some drawings produced before 1831 by De la Beche in his diary, where he ridiculed the approach adopted by Lyell. In these drawings a lawyer (the reference to Lyell, who actually was a lawyer, seems obvious) is carrying a bag with "his" theory around the world, or he is shown wearing particular glasses (like Professor Ichthyosaurus), and offering this "worldview" and the resulting "theoretical approach" to a geologist carrying a hammer, a reference to the applied field geologist. Fig.2. 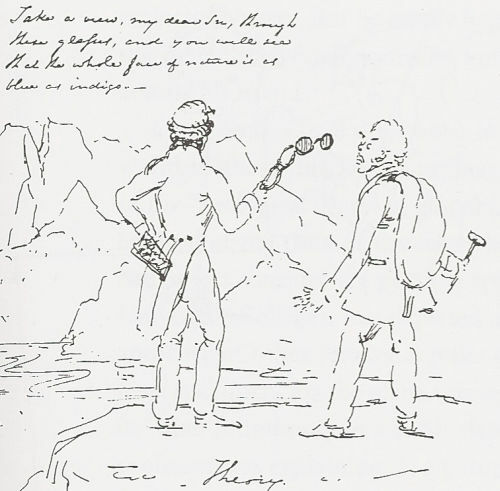 "Take a view, my dear son..." De la Beche's first draft sketch for a caricature in criticism of Lyell's theory - the gentlemen is offering to the applied geologist (with field clothes, hammer and collecting bag) the tinted spectacles to see the landscape - the observable geology - with his theory. De la Beche never completed the sketch, because he abandoned this design in order to try out others (figure from RUDWICK 2008). It's obvious that De la Beche could not overcome his prejudice against Lyell as a lawyer, which he considered much more a theoretician than a real researcher. So "Awful Changes" does lampoon one part of Lyell's uniformitarianism - theory, the concept of infinite time organized in time circles. In a second cartoon (commented by HAILE 1997) De la Beche is mocking the second important assumption of uniformitarianism, the effects of present causes, operating at the same slow magnitude and rate throughout geologic history. Fig.3. De la Beche´s cartoon "Cause and Effect" of 1830-1833. The caption on top notes: "Bless the baby! What a valley he have made!!! ", in the left upper corner De La Beche signed the sketch and dedicated it to Buckland (figure from CLARY et al. 2010). 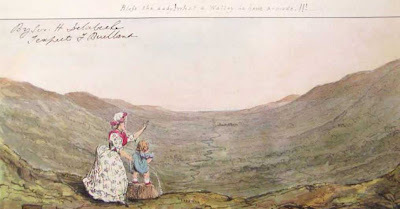 De la Beche's caricature challenges the notion of uniformitarianism and it's slow causes by showing the son of William Buckland urinating to create the (glacial) valley. We see a vast U-shaped valley and in the foreground a nurse with a child, presumably the son of William Buckland. The child is peeing into the huge valley and a caption has his nurse exclaiming "Bless the baby! What a valley he have made!!!" The caricature was inspired by the ongoing debate of river-erosion - still the glacial theory wasn't developed enough to account for the formation of large valleys- and the shape of many valleys in Europe was hard to explain only referring to, as proposed by Lyell's uniformitarianism, slow fluvial erosion. 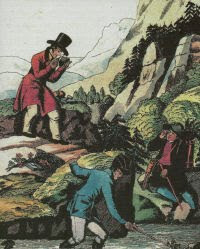 But not only Lyell had to deal with the satiric cartoons; De la Beche himself experienced harsh critics on some of his theories regarding stratigraphy - another part of geology that during the 19th century experienced profound changes. In 1834 Roderick Impey Murchison affirmed that the Greywacke - Formation predates the appearance of terrestrial plants; however De La Beche found just in this formation some fossils, proving Murchison wrong. Murchison gathered support in the Geological Society and publicly questioned De la Beche's ability to identify rock formations, without even bother to look at the fossil plants or the outcrop described by De La Beche. De La Beche in response produced a cartoon showing him engaged in a debate with his many critics - to characterize them he added the symbols of prejudices he already used for Professor Ichthyosaurus, the glasses of theory and the clothes of the lawyer, who limits his research to the living room. It is interesting to note that De la Beche overlooked the detail that he himself wore glasses (appropriately not shown) - also his hair at the time was already a bit thinner than the picture shows. Fig.4. 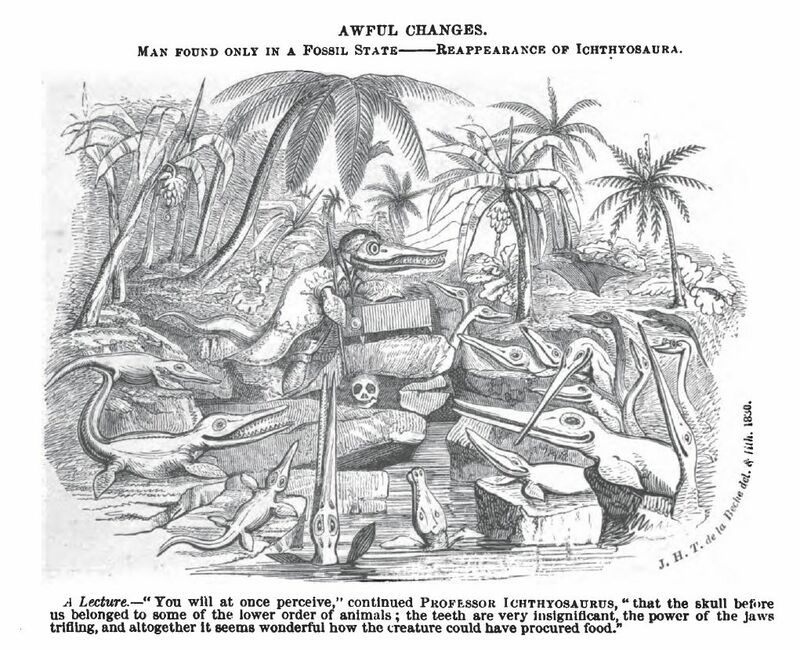 The caricature drawn by De la Beche to lampoon his critics (wearing yet again the spectacles of theory) in the ongoing discussion of the appearance of fossil plants in older geological formations, entitled "Preconceived Opinions vs. Facts" (figure from RUDWICK 2008). De la Beche: "This, Gentlemen, is my Nose." Critics: "My dear Fellow! - your account of yourself generally may be very well, but as we have classed you, before we saw you, among men without noses, you cannot possibly have a nose." Due the nature of caricatures, depicting and reassuming complex contents in a simple manner, nevertheless forcing the observer to understand the "background" of the subject that is made fun of, makes them a valuable tool to teach the development of geology. In a study by CLARY et al. 2010 the history of geology was incorporated into the curriculum of college students via scientific caricatures; students were exposed to the history of the debates surrounding important geological constructs, as well as the social and political environments in which these constructs evolved by showing, explaining and discussing the caricatures of De La Beche and William Conybeare. This method improved significantly the knowledge and the understanding of for example the uniformitarianism-catastrophism debate. Students were also given an option to construct a scientific caricature by itself, choosing from a list of possible topics, and explain the drawing with a brief description. Most students appreciated this option: One student remarked that the drawing of the cartoon "made me think about and understand the subject matter enough to make fun of it". 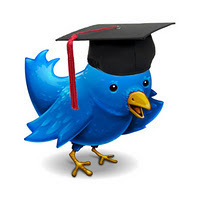 Another student stated, "It also got me more involved in my studying for the exam because I understood what I was doing". Some of the caricatures by the students proved also to be valuable for the teacher - the drawings revealed some misconceptions or prejudices of the students not overcome by the teaching. 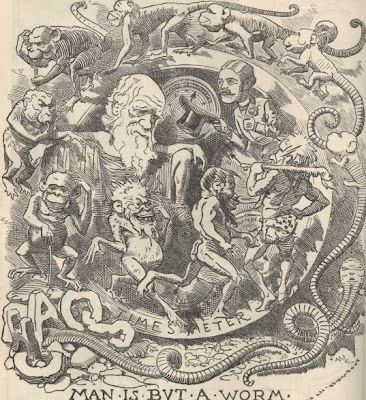 Evolution was frequently chosen as topic of the caricature; however the drawings often referred to the false notion as man descending directly from apes - a misconception persisting since the first years of the publication of "The Origin of Species" (1859), a fact so often and eloquent exposed by Stephen J. Gould (this could be considered as an example how caricatures also can distort or promote bad science). Fig.5. A popular caricature drawn by Linley Sambourne and published in "Punch", inspired by Darwin's last book on earthworms (1882). The (false) latter of progress depicting the transmutation of lower to - presumably - higher evolved organisms was and still is a popular topic for cartoons and caricatures (and is used even in the most modern satire – medium –Youtube-Videos). From caricatures we can not only study the distant past, but also the development of earth sciences in the 20th century (see for example the Chicxulub Catastrophism or Mammals VS Dinosaurs or the Granite Controversy).